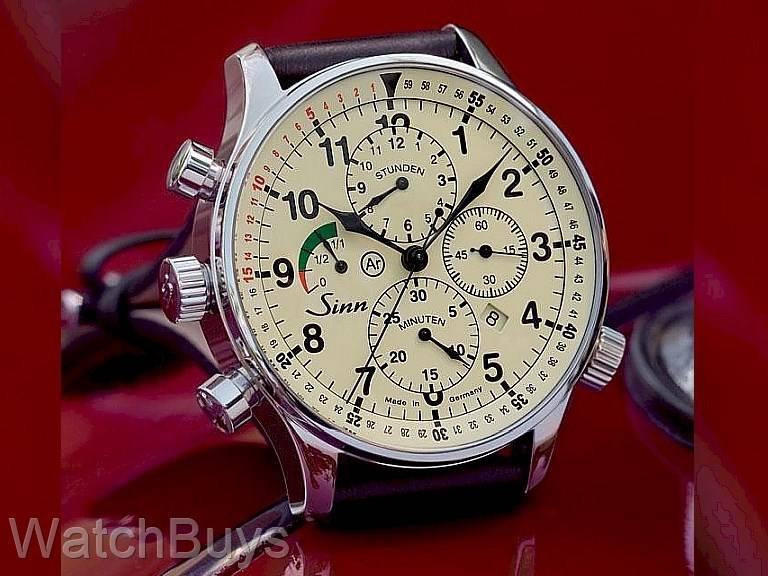 At first glance this watch will probably fool you - the dial coloring and chronograph functions combined with a power reserve indicator sound like the Sinn 956 Klassik. But take a closer look and the differences start to appear. The origins of this watch start with Sinn's CEO Lothar Schmidt. Mr. Schmidt is a big supporter of the German Rallye car races (Rallye Deutschland), and in particular is quite fond of driving vintage cars throughout Germany as part of these races. Traditionally he wore the Sinn 956 Klassik to participate in these races, but one year he noted, as only an engineer would, several changes that would transform the Sinn 956 Klassik into an instrument he could use while racing. The first change was to enlarge the case from 41 mm to 44 mm to increase legibility. Next, the chronograph pushers and crown were relocated to the left side of the case to facilitate using the watch while wearing traditional racing gloves. And finally, Mr. Schmidt designed an easy-to-set countdown bezel just under the sapphire crystal that makes it possible to read off finish times with precision. The rotating bezel is set using the crown at 4. Of particular importance are the red numerals to call attention to the all-important final 15 seconds of the race. The end result - a true German Rallye car watch with power reserve indicator, chronograph functions and countdown bezel. If you drive a German car, this watch is the perfect companion. We would however like to remind drivers in the US and Canada that the Autobahn is uniquely German with its areas of unlimited speed, so when wearing this watch resist the urge to test the maximum speed of your car and save that test for your next trip to Germany.